CHVRCHES haven’t strayed far from their 2013 debut winning formula with this neat collection of unadulterated synth-pop on Every Open Eye. This is a Glaswegian trio who know exactly what they’re saying. Unapologetically and unashamedly banging out 13 tracks of pure synthesized ecstasy, CHVRCHES is clearly a band with their hearts, souls, and minds all completely unified and their minds fixed on a shared single destination. It’s the best part of the 1980s pulled apart, then reinvented, and updated for today’s audience. 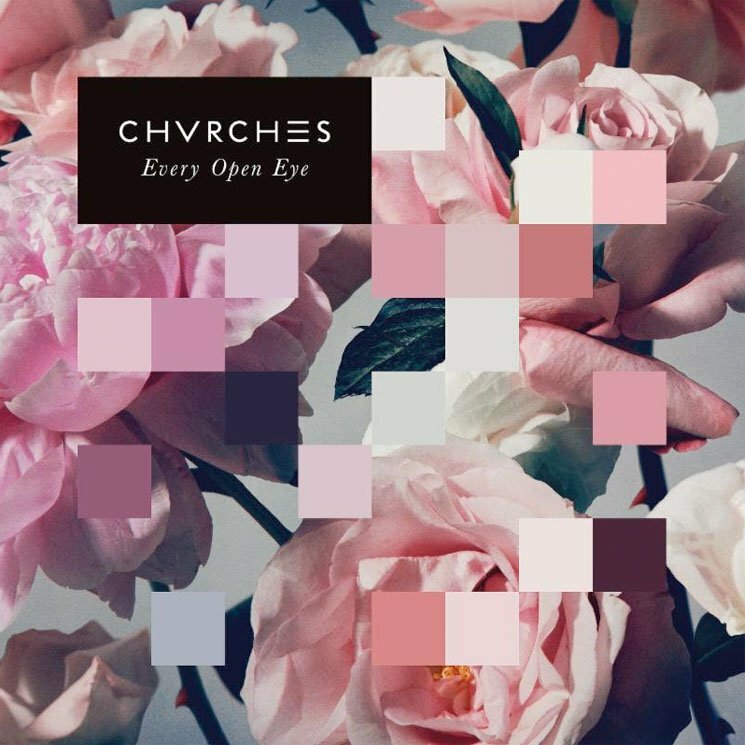 Every Open Eye opens with “Never Ending Circles” and it pretty much tells you all you need to know about CHVRCHES, it’s all bleepy little beats and high reaching vocals, a softly melting middle section, then back up for an elevated three beat sudden ending. The next couple of tracks are of a similar vein and then the fourth track “Make Them Gold” kicks in with some motivational lyrics about using our mistakes and making better versions of ourselves. CHVRCHES have obviously heeded their own advice here. This one may be a bit too saccharine sweet for me, but with the ‘gold’ reference here, I’m foreseeing a big tie-in with the television coverage of the 2016 Olympic Games. Other stand out tracks are “Clearest Blue” with more than the shadow of a hint of echoes of Depeche Mode, and the fast paced, rousing “Bury It.” Lauren Mayberry’s vocals spiral skywards taking the song (and the other two thirds of the band) along with her on a skyrocketing ascent of loveliness. The weak spot in the album for me are the couple of tracks where Lauren doesn’t take lead on the vocals (“High Enough To Carry You Over” and “Follow You”), these tracks are okay, but they don’t quite hit the spot like the others. All in, Every Open Eye is a clear fresh take on the sounds of the ‘80s, it’s synthy nostalgia with the depressing parts painted over. CHVRCHES can take me back there anytime. I have a feeling this album will be big.